In my opinion, boots are the most important part of your kid’s gear. Bad boots=more difficult skiing=unhappy kid. You want to ski as one big happy family? Everybody’s boots had better fit and everybody’s feet had better be warm (or at least close to warm). Will Last Year’s Ski Boots Fit My Child This Year? Here you go. Step-by-step tips to help you decide if your child needs new ski boots this season. Center your child’s bare foot against the sole of the boot. There should be about an inch of sole remaining on each end. Step one. Center your child’s foot on the bottom of the boot. Take out the boot liner. Put your child’s foot, now wearing a ski sock, into the boot shell. Ask your child to stand up and move her toes forward to the tip of the boot. Have him flex his ankles, bend his knees and move forward into a skiing position. Get a flashlight and look down into the boot behind the child’s heel. There should be 5/8” – 1” of room between her heel and the back of the boot. You may have seen boot fitters use dowels to measure this. If you want, get a piece of 5/8” and ¾” dowel. Put a dowel into the boot between the heel and rear shell to measure how much space is there. Step Two: Checking the ski boot shell size with a flashlight. Put the boot liner back into the boot. Using both hands, pull the tongue out-of-the-way and separate the overlapping fronts of the boots as wide apart as you can. Your child now has a clear entryway for his foot into the boot. Buckle the boots and have your child walk around a bit. If your child complains that the boot is too tight, but the shell measured as if it still fits, don’t give up on the boot. Boot liners can be stretched to get another season out of them. Take them to your ski shop for stretching. If your child has a “high-volume” foot, you may need to go up a size. If everything checks out, but your child complains that the boot is too short, make sure he is flexing his ankle and driving his knees forward into an athletic skiing position. This moves his heel to the back of the boot and should provide room for wiggling his toes. In a front entry boot, you can tell if he is flexing the boot by watching the boot hinge forward at the ankle. Push down on the top of the boot while it is on the floor and without a foot in it to see what you are looking for in flex. Jack flexes his ski boot so that Kent can check the fit. Rear entry kids boots are sometimes easier to flex for a small, young skier. Front entry boots provide more stability because they fit more snuggly and I think they keep the heel down and hold the foot in place better. But if your child can’t flex his or her ankle inside the boot, he or she will not be able to center their weight on the ski properly. Some kids have feet that are large enough to fit into an adult boot, but they don’t have the strength to flex an adult boot. Before you hand your old boots down to your pre-teen, make sure they can flex them. The mm marking along the side of the boot tells the exterior length of the boot sole. The number on the bottom (usually something like 23.5) is known as Mondopoint or World Sizing and tells the size of the boot on the inside. Click here for a ski boot size conversion chart that will help you find your size. Chronically wet boots are the primary cause of cold feet. You may not even think your boots are wet or damp, but deep inside, they probably are. Invest in a boot dryer. We have both hot sticks and fan dryers. They are cheap, have seen a lot of use and are still going strong. One pair of wool socks is all you need. No need to layer. Kids need a bit more room in their boots than adults do. 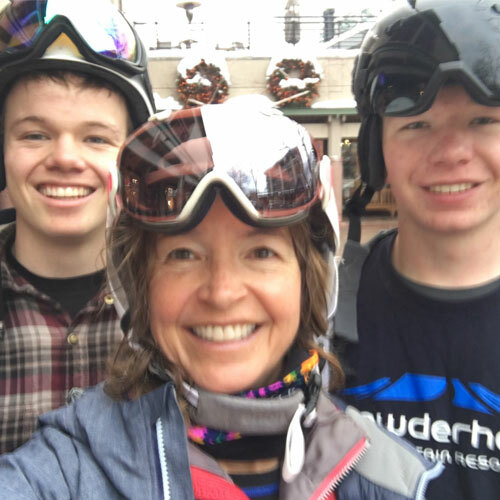 You don’t want the boots to be loose, but just by the nature of their bodies and low center of gravity, younger kids may naturally sit back a little, especially when learning to ski. They need a bit more room in the toe to accommodate this different center of gravity. Make sure they can wiggle their toes. The ski boot toe buckle should be snug, the ski boot buckle over the top of the foot should not. There is an artery that runs across the top of the foot. Smash it down with a tight buckle and circulation to the toes is restricted. Kids, especially little kids, expend a ton of energy skiing and learning to ski. Hungry and thirsty kids are cold kids. Keep snacks in your pockets to share on the lift. Never miss a meal…or at least a solid ski snack! If you are driving to ski, put the ski boots in the back seat with the kids (or under the passenger side dashboard), preferably near a floor heating vent. Raise the temperature of the boots to just above body temperature. Try to avoid putting boots in the “way back” or trunk of your car. Also, never store your boots overnight in a cold garage or car. One thing to consider? A heated ski boot bag. Put your boots in the bag (by themselves) and plug the bag in for between 6 and 12 hours. This will both help dry the boots out and keep them warm. Some heated bags even have an adapter that let’s you plug the bag into your car.